The collection of Antwerp art merchant Charles Van Herck (1884-1955) comprises over 700 drawings and 110 terracotta objects from the 17th to 19th centuries. The pieces are above all preparatory works for monumental sculptures and sculpted ornamental liturgical furniture and were created by artists from the Southern Netherlands, particularly from the Antwerp region. The collection reflects rather well the development of sculpture in the Southern Netherlands from the second half of the 17th century onwards and provides a key source for the study of works of the Antwerp Baroque period as well as for how the sculptures were created. The drawings and terracotta objects are of great interest from an aesthetic point of view too because they brilliantly illustrate the artists’ creativity and virtuosity. They also provide important documentary evidence since over the centuries a significant number of sculptures and sculpted groups from the period have disappeared. The Charles Van Herck Collection includes preparatory works of important artists such as Lucas Faydherbe, Artus Quellin the Elder, Jan-Peter van Baurscheit the Elder, Michiel van der Voort and Laurent Delvaux. It was thanks to these masters that the Antwerp School acquired an international reputation, based on the power of its representations, its knowhow and its artistic qualities. ​The birth, as well as the enrichment, of the collection coincided in large measure with the Van Herck family’s history as antique dealers in Antwerp. Numerous drawings had been in the family for many years and they had become part of Charles’s collection thanks to inheritance from his grandfather, father and aunts. Others were given to him. His collection also grew thanks to the purchase of drawings at auctions organised by the family firm or from other eminent Antwerp families. 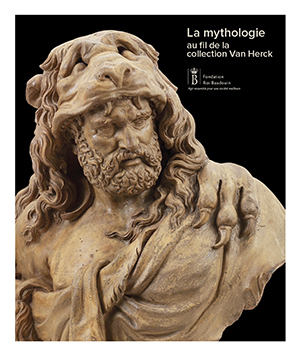 Unlike the drawings, practically all of the terracotta pieces in the collection were acquired by Charles Van Herck himself. In his work as an art dealer, he discovered many works in the houses of Antwerp, some of which he managed to purchase himself. Six petites têtes d’ange (Six Little Angels’ Heads) by Walter Pompe was his own first purchase, made in 1907 in his Aunt Marie’s antique shop on the Grand-Place. It was also thanks to his Aunt Marie that he bought Apollon et Python (Apollo and Python) by Artus Quellin the Elder in 1909, one of the masterpieces of his collection.